Top 'o the mornin' to ya. We had a wonderful St Patty's day spending hours and hours outside together - starting with a bit of yardwork (cutting down the Karl Forester grasses for the year so the new growth can start coming up). We had some water table fun, then went for a long walk around the lake near our house, and played at the playground for-ever... for-ev-er... (name that movie, and I'll be super impressed!! Think early 90s). 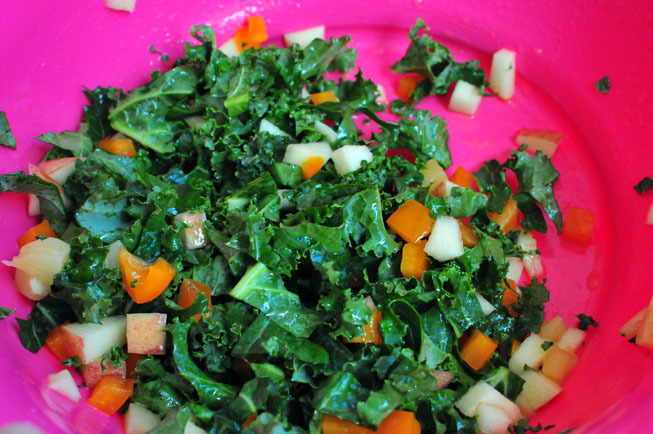 When we got home for lunch I came up with a DELICIOUS kale salad! And here's the final product... voila! 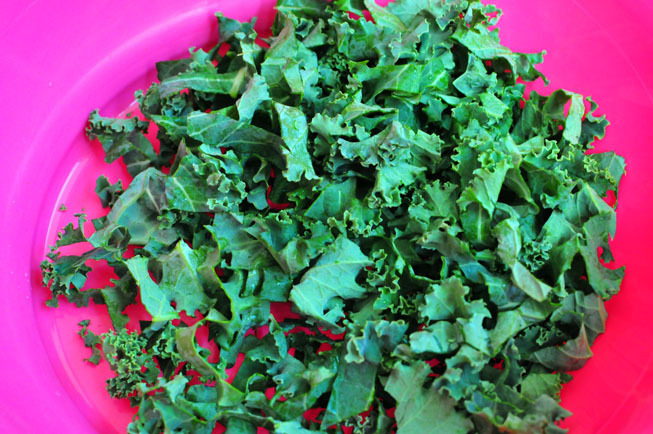 You may be asking yourself, what's so special about Kale? It is one of the healthiest vegetables on the planet, according to WebMD! **UPDATE: Besides the health-appeal of this salad, the other thing that makes it so special is that it keeps super well. It does NOT get wilty like normal lettuce/spinach salad. 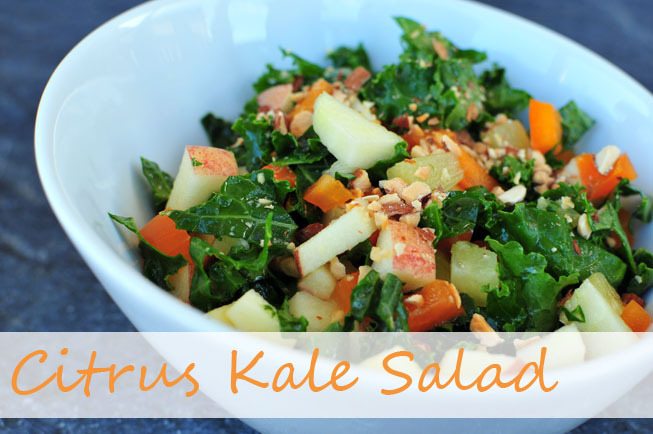 The kale stays crisp and bouncy. This salad was JUST as good 3 days later as it was on its original debut. Babycakes enjoyed some "Green" food as well. 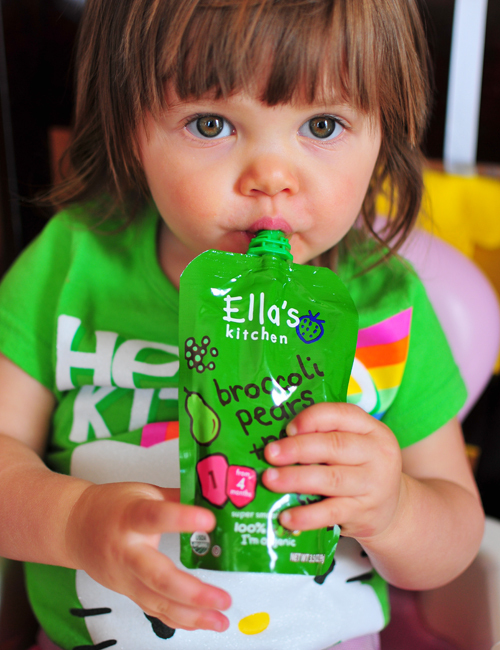 Here she is eating a "Broccoli/Peas/Pear" pouch from Ella's Kitchen, sporting her green St. Patty's day Hello Kitty shirt. She is just too cute, and look at those eyes! 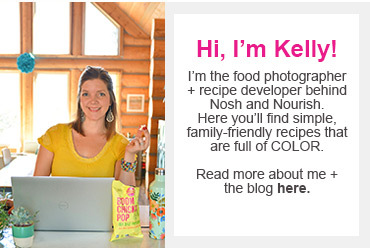 I also spent some time putting together a pseudo "About" page. Check it out here. What did you enjoy for St. Patty's Day? 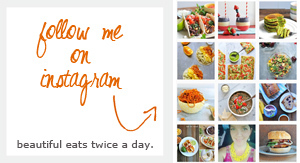 Do you have a specific healthy food that you use in lots of different recipes? Can you name that movie quote?